Over time Fredonia Enactus had grown vast amounts, doubling member amounts and adding various new projects. We needed a systematic approach to project management, in order to manage our large and diverse skillset. Thus, the Template for Cultivating Growth was born. ​20 Fredonia Enactus students participated in BNY Mellon Project Management certification, a course that taught the fundamentals of successful project management. During that same semester, 3 Alumni returned to our campus to share Walmart’s Agile Project Development system to team leaders. The insights and ideas gained from these tools were then grown into our own system: The Template for Cultivating Growth. Each project is a tree. Every division is a species of tree. 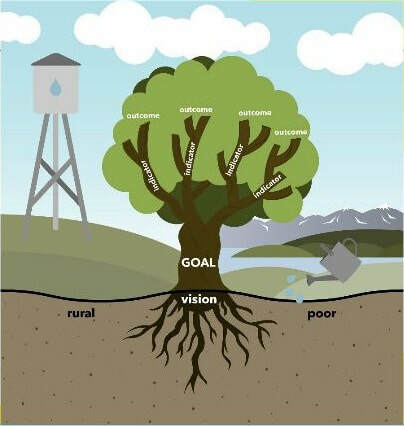 Our soil represents our needs assessment. It grounds us. From it we hope to grow our seed; Our Vison. Like a seed requires water, our vision requires action. We gather our Enactus drops from Fredonia’s water tower to provide the best care for our projects. With each drop of action, our vision roots and our project grows. We hope for a project with a bounty outcomes; A tree rich with leaves. Our outcomes cannot exist without clear relevant indicators.